Also available as a paperback book or download from lulu.com, and also from Amazon (where the book has also been reviewed). This e-book is divided into html pages by sections of chapters. Summaries are provided for both chapters as a whole (below), and sections of chapters. Click on a chapter heading below to view the chapter page containing more detailed summaries of sections: in turn you can click these to take you to the full text for that section. The <?xml:namespace prefix = st1 ns = "urn:schemas-microsoft-com:office:smarttags" />Middle Way is presented as the best basis of assessment for Buddhism, and first applied to the Four Noble Truths because these are the most commonly offered basic and universal teaching of Buddhism. 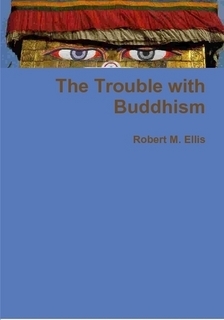 These teachings contain important insights, but are often presented in a misleadingly metaphysical way that conflicts with the Buddha’s teachings on metaphysics. It is suggested that the ‘Four Noble Truths’ would be better thought of as ‘The Four Noble Principles’ and put in a different order. This chapter argues that the ways in which claims to knowledge are commonly justified in Buddhist tradition are often contradictory, and that the Middle Way offers a more objective way of justifying beliefs, even though short of the certainty we might expect for 'knowledge'. Buddhism is often misleading in its claim to be based on experience rather than dogma, and its traditional reliance on gurus and scriptures is central to the confusion in sources of knowledge. Buddhism can be praised for its practical and non-alienated approach to love and compassion, but the success of this approach is often undermined by an over-idealised presentation of the ideals of love and compassion, and by contradictory views about the relationship between love and self-sacrifice. This chapter argues that traditional Buddhism ideas about karma and rebirth are metaphysical, beyond all relationship to experience, and contradictory. The supposed moral benefits of belief in karma are bogus: on the contrary, dogmatic adherence to a metaphysical belief like that of karma is morally undermining. The supposed evidence offered for rebirth may point out some mysteries, but does not clearly support rebirth. Conditionality is often put forward as the underlying philosophical principle of Buddhism. Put in its most general terms, this principle is shown to be empty and thus practically useless. Buddhism is right to point out the value of recognising conditions, but it is specific conditions in our experience that we need to recognise. Universal claims about all conditions are merely dogmatic and not helpful. Whilst it is helpful in pointing out the value of recognising all kinds of conditions, Buddhism often extends this unhelpfully into metaphysical claims about a “reality” we cannot possibly know about. The doctrine of emptiness is often used to disarm critical thinking, but much of the scriptures that go on about it offer much dogma and little of practical value. Buddhists who latch onto quantum physics or a worship of ‘nature’ are similarly mistaken in thinking that practical value rests on understanding underlying metaphysical laws of the universe. The Buddha figure, and the other symbols of enlightenment in Buddhist art, are said to appeal to the imagination and provide inspiration. However, they often fail to do so because when they represent ideals of purity or achieved enlightenment, rather than a possibility of progress that relates to our experience. The ambiguities in the idea of ‘dharma’, which is both Buddhist teaching and ultimate truth, can create a confusion between the two. If the dharma, or central teaching, is to be truly universal, it needs to be more clearly separated from the cultural context in which it arose. The basis of Buddhist criticism of other religions is contradictory given that it often shares many of the metaphysical assumptions criticised by Buddhists. The idea that Buddhism is a uniquely tolerant religion has also been oversold. The monastic tradition in Buddhism is closely associated with a major inconsistency between ‘karmic’ and ‘nirvanic’ Buddhism, and with many practical difficulties in living up to the exaggerated expectations made of monks. The idea of replacing a monastic order with a non-monastic one merely dilutes this problem rather than dissolving it. A better form of social organisation for modern Western Buddhists might be modelled on that of the Religious Society of Friends. Buddhist ethics offers the practical possibility of moral value based on the Middle Way, but this has been confused by the frequent confusion of ethics with purity in the Buddhist tradition. This confusion is found in the monastic rules, in common interpretation of the precepts, and in the Mahayana doctrine of skilful means. Western academics giving merely descriptive accounts of ‘Buddhist ethics’, not really interested in moral justification and critique, have reinforced rather than challenged the dogmas in traditional Buddhist ethics. The meditation tradition in Buddhism offers the world some invaluable tools to aid greater awareness and insight, but here too is traditional obfuscation, from the exaggerated claims made for instantaneous enlightenment in Zen to the mumbo-jumbo surrounding mantras. Very often the insights potentially offered by Buddhism are shut off because Buddhists present it in misleading or contradictory forms and language. An analysis of five different ways is offered in which Buddhism is often misleadingly or off-puttingly presented. It's not too late to renew Buddhism in the West, but we are probably mainly dependent on those coming to it afresh to do so.